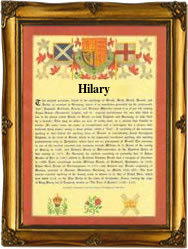 Recorded as Hilary, Hillary, Hillery and the dialectals Ellary, Elleray, Ellerey, Ellery and Elray, this is an Anglo-Irish surname of usually Norman-French origins of which it has two. The first is derived from the Roman (Latin) and later French word "hilaris" meaning "cheerful one", and as such was also the name of several early saints and popes. Although it is understood that the name did exist in England before 1066, it was particularly popular with the Normans, initially as a personal name and from the 12th century, as a surname. The Hillaryes, as spelt, were amongst Strongbow's Anglo-Norman army which invaded Ireland in 1170, and later they became established in County Clare. Patrick Hillary was the President of Ireland from 1976 to 1990, whilst Sir Edmund Hillary of New Zealand was the first conqueror of Mount Everest in 1953. The second possible origin is from the female name Eulalie of Greek origins and recorded in England as Elaria and Hillaria, thereby creating an overlap with Hilaris above. The first recorded spelling of the family name is believed to be that of Richard Illarie which could have come from either origin, of Stafford in 1227, William Hillari in the Hundred Rolls of the city of Lincoln in 1275, and Agnes Ellerie of Lancashire in the will register of the year 1664. Throughout the centuries, surnames in every country have continued to "develop" often leading to astonishing variants of the original spelling.